Included in this guide are instructions for installing the trial version of QuickBooks Desktop provided with your textbook solution. Also included are instructions for toggling to the Pro edition of the software (necessary for some users). Be sure to check out the Common Questions section at the end of this guide. Note! If you are taking a class on QuickBooks Online, please see this page instead for instructions on setting up your Intuit QuickBooks Online account. Note! Your trial software is for use on a Windows PC. It cannot be installed on Mac computers or mobile devices using the iOS or Android operating systems. See here for more information on QuickBooks system requirements. Before you get started, have your license key and product number handy. QuickBooks 2017 and 2018 users: Your 15-digit license key is printed on the inside front cover of your book. If you are using QuickBooks 2018: Level 2, an error in the 3rd printing caused the codes to be swapped on the book covers. Your QuickBooks license key (15 digits, numbers only) was printed in the top box, and your Labyrinth ebook Activation ID (12 characters) was printed in the second box. QuickBooks 2015 and 2014 users: Redeem your Activation ID and receive your 15-digit license key here. If you purchased an ebook, you already have your license key! Check your email. You may redeem your Activation ID one time only. If reinstalling, use the license key obtained when you first redeemed your Activation ID. Do not attempt to redeem your Activation ID more than one time. Close all running programs, including antivirus programs. Remember to restart your antivirus program(s) after the software installation is complete. *Important: QuickBooks 2104 is no longer supported by Intuit and is not compatible with Windows 10. The following steps assume that you are using the Microsoft Edge web browser. Depending on the web browser used, your steps may differ. Click Run in the download bar, and then click Yes in the dialog box that appears. Click Next in the wizard screen; click Next in the Intuit QuickBooks Installer window. Click in the checkbox to accept the terms; click Next. Ensure that Express (recommended) is selected; click Next. Type your license number and product number in the provided boxes; click Next. The installation can take time, so be patient! Click Open QuickBooks in the screen that appears after the installation is complete. If a notice regarding how QuickBooks uses your Internet connection appears, click OK. The QuickBooks trial software is now installed on your computer. Toggle to the Pro edition of the software, if necessary for your course. Your trial software defaults to the Accountant edition. If you are using a Labyrinth Learning "QuickBooks Pro" book, you must toggle to the Pro edition of the software every time you start QuickBooks. It's easy! Note! If you are using a Labyrinth "Payroll Accounting" book, there is no need to toggle to the Pro edition. In QuickBooks, choose File > Toggle to Another Edition. 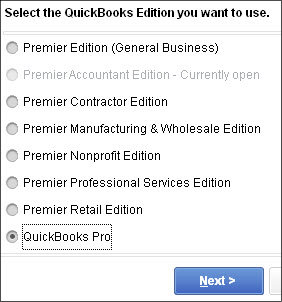 Click in the circle to the left of QuickBooks Pro and then click Next. Click Toggle; click OK in the Close Accountant Center window. QuickBooks will close and then reopen in the Pro edition. The title bar will show that you are using the Pro edition “via” the Accountant edition. How do I know if I have a digital download? Look for a product/license key or an activation ID on the inside front cover of your book or on a square card bundled with your book. This information is used for the digital download. What is my product number? For QuickBooks 2018, use 129-813. For QuickBooks 2017, use 760-899. For QuickBooks 2015, use 503-153. How is the 30-day registration period different from the 140-day trial? Within 30 days of installing the software, you must register it with Intuit. The trial software is good for 140 days total from the date of installation. Do I have to toggle to the Pro edition? If you are using a "QuickBooks Pro" book, you must toggle to the Pro edition so your screen matches the figures in the book. Remember to toggle to Pro every time you start QuickBooks. If you are using a "Payroll Accounting" book, you do not need the Pro edition. What if I am taking a QuickBooks course and a Payroll course at the same time? Install the software just once using either license key. Save the second key to install the software on another computer -- or on the same computer after the first trial expires. What if I am taking a QuickBooks course and a Payroll course in different semesters? Install the software initially using either license key. If the trial expires before both classes end, uninstall the expired trial and then install again using the other key. Remember: For best results, uninstall and then install! How do I use the QuickBooks trial software with my Payroll Accounting textbook? Refer to your "Payroll Accounting" student resource center or eLab course for guidance. What if I’m using a Mac? Your QuickBooks trial software is for use on Windows-based PCs. It may not be installed on Mac computers or mobile devices using the iOS or Android operating system. More information about QuickBooks system requirements is available here. For additional software support, please visit the QuickBooks support website.